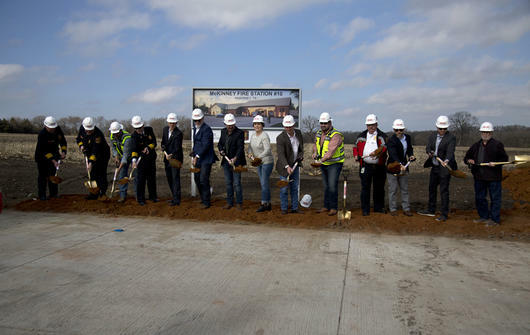 Trinity Falls moved a step closer to having a fire station located within our community when the McKinney Fire Department broke ground on Fire Station No. 10 Jan. 18. The planned 16,000-square-foot station will be located on CR 228 west of Trinity Falls Parkway. Based on the floor plan of Station No. 9 — the first new fire station to open in McKinney in seven years — the facility will include three apparatus bays and housing space to accommodate 10 firefighters. A community room will be available for public use. Fire Station No. 10 is part of a strategic plan to best protect all areas of the city, which has experienced exponential growth. Named one of the top 10 fastest-growing cities in the nation, the McKinney population has grown 365 percent during the past 20 years.